Great location, very affordable and tastefully decorated 2 bedroom (each with queen size bed plus queen size sleeper sofa), 1 1/2 bath Gatlinburg chalet located just 4 minutes from downtown Gatlinburg/Great Smoky Mountains National Park. Free wi-fi. 15 minute drive to action-packed Pigeon Forge. Very clean and private with all the comforts of home. Chalet offers 5 person hot tub/whirlpool and air hockey table. Lover's Loft chalet is close enough to enjoy all that Gatlinburg has to offer yet far enough away to enjoy the solitude and serenity of the mountains. Our guests come to Lover's Loft to celebrate their honeymoon and return for their wedding anniversary and eventually to bring their own children. We hope your family makes wonderful memories of the Smokies as we have. This is our home away from home. We are a family of four from Cincinnati, Ohio. We fell in love with the Smokies many years ago and love going to the chalet any chance we can get. We love all the seasons the Smokies have to offer. We chose to buy in Gatlinburg because we love to hike in the Great Smoky Mountains National Park. 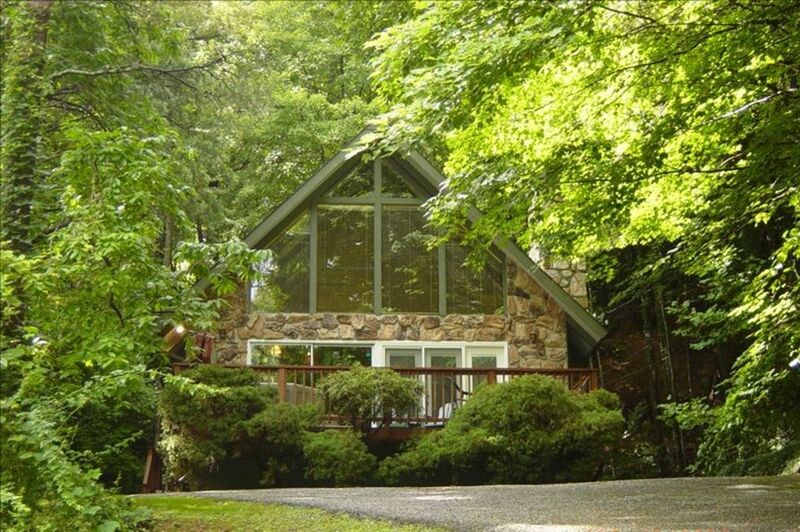 Our chalet is just 4 minutes from the National Park/ downtown Gatlinburg. Our kids each took their first hike in the Smokies when they were just 2 months old. Gatlinburg is such a family place and we have enjoyed numerous vacations with our children. We are close to everything!! Bed sheets, pillows and pillowcases, blankets, bath towels and kitchen towels provided. Private. In front of chalet. Full amenities. Dishware, pots and pans, utensils, cookware. In season - Memorial Day thru Labor Day. 2 minute drive from chalet. Glad you enjoyed the chalet and all it has to offer! Gatlinburg is a great place visit during all seasons! It's a wonderful house on a mountain, just 3 minutes from ski mountain place. Me and two of my sons had a great time at Jim and Cathy Janszen Mountain House. This house has good placing, 3 minutes from center of the city, and 3 minutes to the ski/snowboard place. This house has a lot of light in it, beds are comfortable. there is no problems with temperatures, no cold areas. There was extra logs for fire in the fireplace thanks for that. Wonderful hot tub that helped as worm up after we all freezed wen were skiing. In kitchen they have everything you need. Just the table hockey wasn't working. Owners are very friendly, and answered all of our questions. Next year we will come back to this great place. Thanks for all the kind comments! We love our chalet too. Can't wait to hear from you again for next year's visit! Clean. Nice, quiet location. Close to center of Gatlinburg. Great Place to spend Christmas. Thanks again to the owners for keeping everything clean and functioning. My family had a wonderful time here. 2 kids - aquarium is a must! Can't remember the last time i had such a peaceful time. A peaceful vacation...that's awesome to hear! In agreement about the aquarium...it's the BEST! The Lover’s Loft was perfect for our stay in Gatlinburg! We had a wonderful time! Convenient to downtown. The owner’s were very friendly informing us of the Christmas parade that weekend. We had everything we needed. The chairs by the fireplace were very comfortable. We did not use the hot tub because it didn’t really get hot enough since it was cold outside. Air Hocky was fun! Downstairs bed was very comfy as well. Overall, we enjoyed our stay and will go back when we visit Gatlinburg again. Thanks for the kind words! I'm glad you enjoyed the chalet and all that Gatlinburg has to offer! Easy access to Gatlinburg or parkway! Pretty views and quiet location. New furnishing in living area and air hockey table was a hit with our oldest! Did not use hot tub but looked nice! Bathrooms and beds a good bit dated. Good accommodation for the price! FYI: new mattresses/box springs purchased August, 2018 for both beds. Hope to hear from you in the future! WE ARE FLEXIBLE WITH REGARD TO OUR RATES!